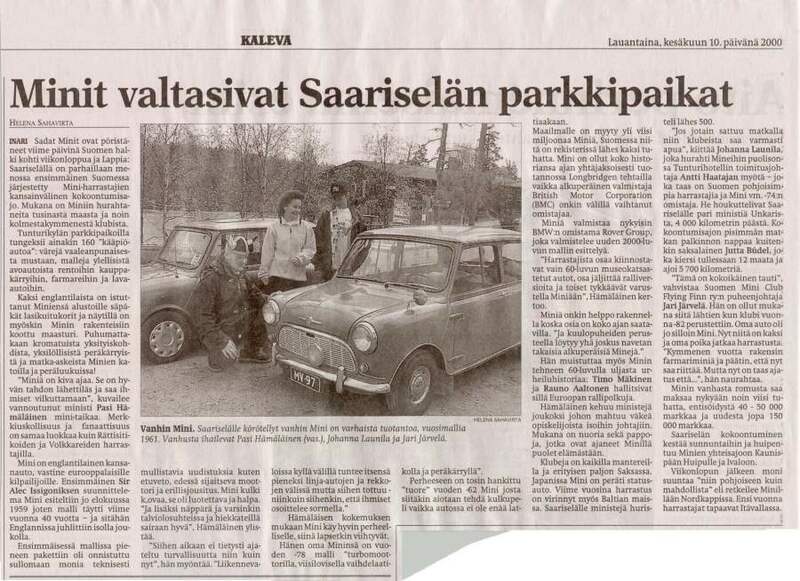 Here are some scan's as made by 'Andy in Belgium' of article's that appeared in the local newspapers in Finland. Below are the 'Rules for hosting an IMM', as well as the 'Minutes of the Presidents meeting' during the IMM. The IMM will take place on the European Whitsun weekend, except on anniversary years when it will be held in England during August to coincide with the Minis Birthday. Future IMM hosts will be selected at the Presidents Meeting, two years in advance. Exceptions have been made in the case of Anniversary events in England, due to expected larger attendance numbers. These have been given 3 years notice. The Presidents meeting to be held in English. The IMM will have a 3-day format. The host Club will have the option of whether to open the event to ALL Mini owners or keep it as an IMM for Club Members only. IMM site to be Minis only. Trailers and caravans on site, must be towed by a Mini. Alternative parking arrangements must be made available for non-Minis. Security should be a consideration on all sites. All fees to be paid in Hosts clubs national currency. No IMM Club will organize any event on the same weekend as an IMM. When bidding to host an IMM, the booking price should include camping and entrance to the IMM, however if the Club were in a position to offer food then this could be offered as an option. The host Club should ensure that there are sufficient Toilets & Cleaning facilities. A suggested guide figure is: 1 wc per 100 females, 1 wc for 100 or less males, 2 wcs for 101  500 males, 3 wcs for 501  1000 males plus, 1 wc for every additional 500 males, 1.5 metres of urinal per 500 males. 1 hand basin per 5 sanitary conveniences. Fully detailed guide line figures available from hosts of IMM99. Plumbed in facilities would be preferable. The host Club should provide an adequate and suitable information stand. There wasn´t any problems. Feedback was very positive; good organization, staff and happening. 2. IMM 2001  Presentation by Mini Club Oberösterreich Meeting is 1st  4th June 2001. 3. IMM 2002  Presentation by Caledonian Mini Club Extensive presentation pack. Lots of talking about dates and rules. Finally Presidents Meeting agreed that the date will be 24th  27th May 2002 and no other clubs are allowed to organize any meeting during that time. 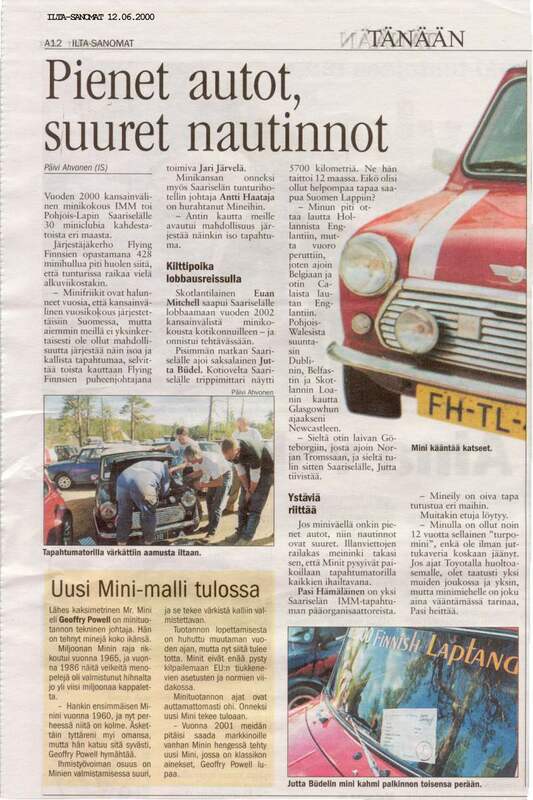 Some were asking about deals with shipping companies; Caledonian Mini Club will give more detailed information in Austria. 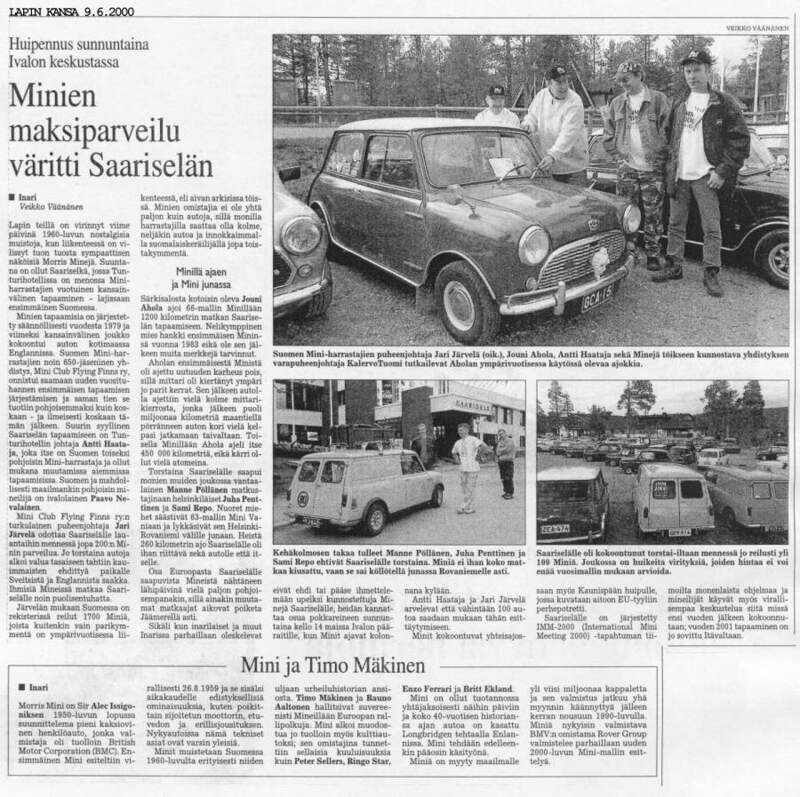 Mini Club of Belgium was first interested to make a presentation for 2002 but noticed how much work Caledonia Mini Club has already done for 2002. Mini Club of Belgium will make their presentation for 2005 in Austria. Everybody agreed that the International Mini Meeting 2002 will be held in Scotland. What to do with the club who doesn´t stick to the rules? Decision to take the rules as a guide line (also with the dates) and send a letter to German club to tell that IMM were not happy what happened. Rules are sent again to every club who are on the IMM2000 list. 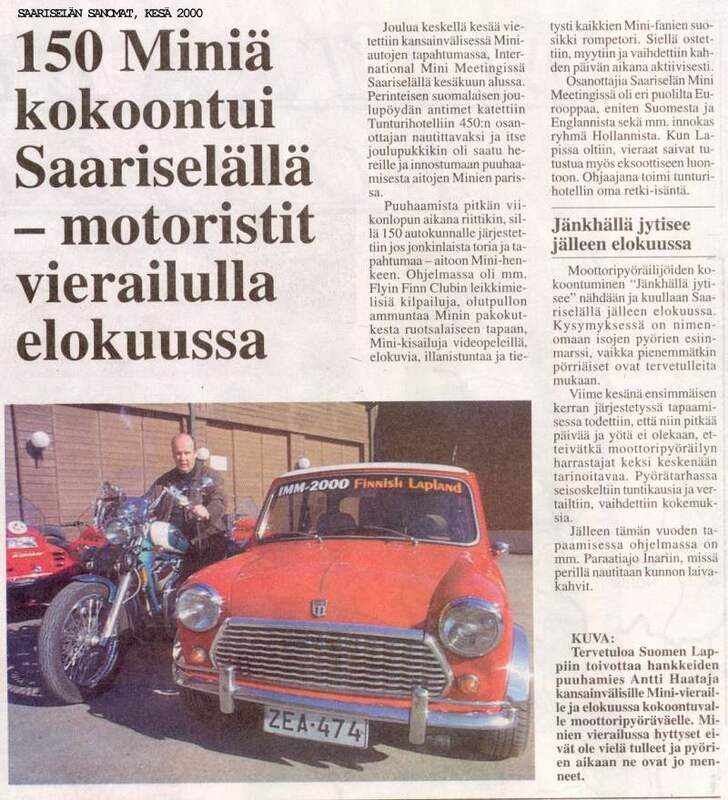 Anglian Mini Club made a proposal that they might host IMM2004. 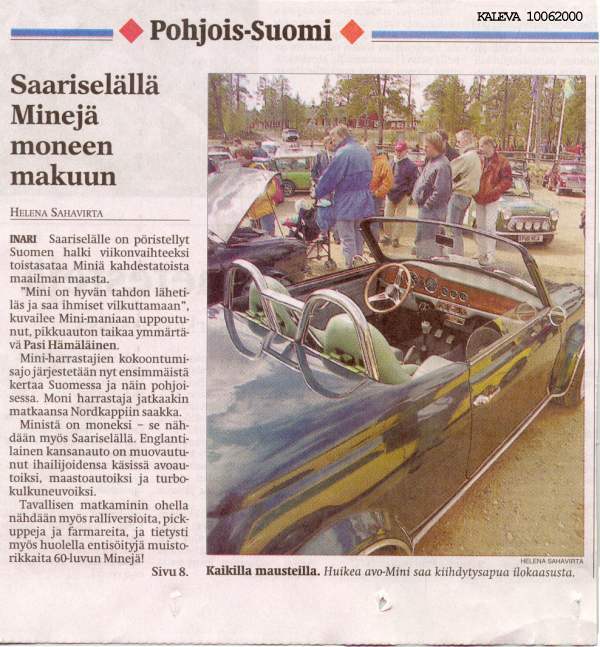 Antti Haataja thanked everybody for their attention during the meeting and reminded everyone to enjoy the big & free drink buffet. The meeting ended at 4.15 p.m.